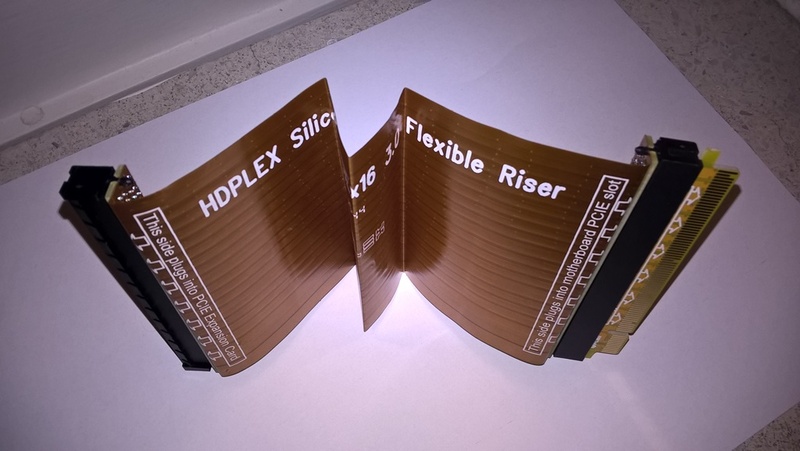 Received the HDPLEX Silicon riser (click “Package contents” for more pictures) today and boy what a great riser that is. This might be the one I’ve been looking for all this time. The riser just looks gorgeous. It’s also extremely thin as you’ll see in later pictures. You’ll immediately notice that there are no retention clips on the connectors. 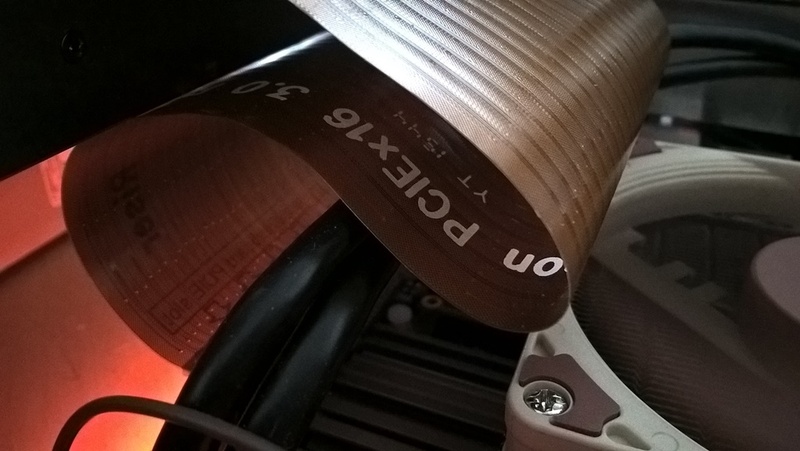 Their friction force seems to be much higher than that of regular PCIe connectors, I wouldn’t worry about them coming lose at all. Not necessarily a problem, but certainly a weird solution. The riser has female ports on both ends and uses a small adapter plate to plug into the mainboard. What makes this even weirder is that you can’t plug it in backwards. 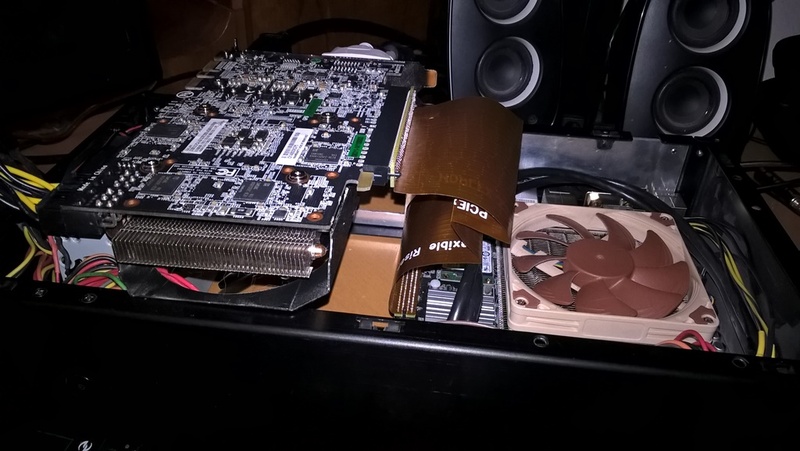 I tried it, but the GPUs fans were running on full tilt and I got no picture on the screen, so I pulled the plug. Luckily nothing got damaged. On the bright side (HA! ), the riser is actually somewhat transparent so you can see light shine through. Let’s try it anyway. Here you can see the riser being mounted in Freilite Alpha. Despite looking so damaged, the riser actually works with no problems whatsoever. 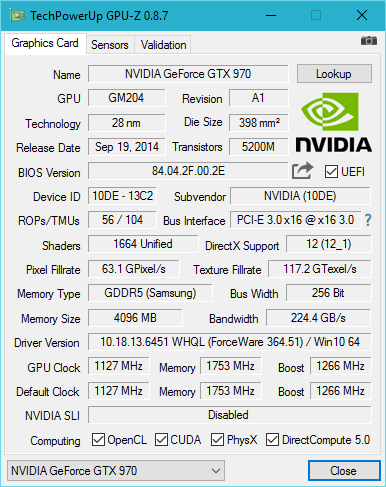 I had to reboot once because GPU-Z showed the GPU to run @ x16 1.1 instead of 3.0 as you can see here. 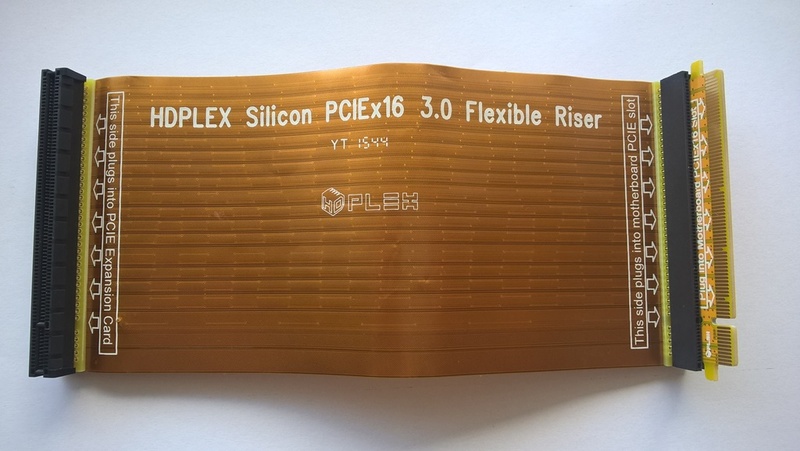 Here you can see how thin and flexible it is. Exact thickness measured with a dial caliper is 0.14mm. Did I say flexible? I folded the riser five times, sharpening the edges with a ruler. The bend radius is close to zero at this point. 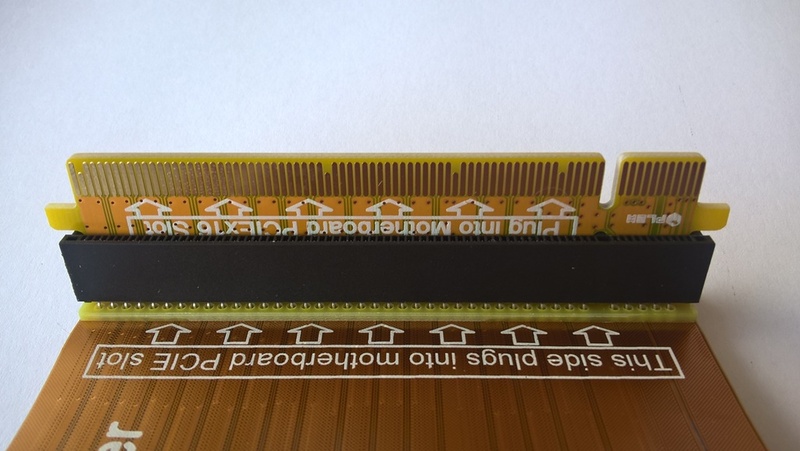 The two folds directly at the connectors were the most interesting, I left about 2mm to the PCB the FPC is bonded to. Bird it is. 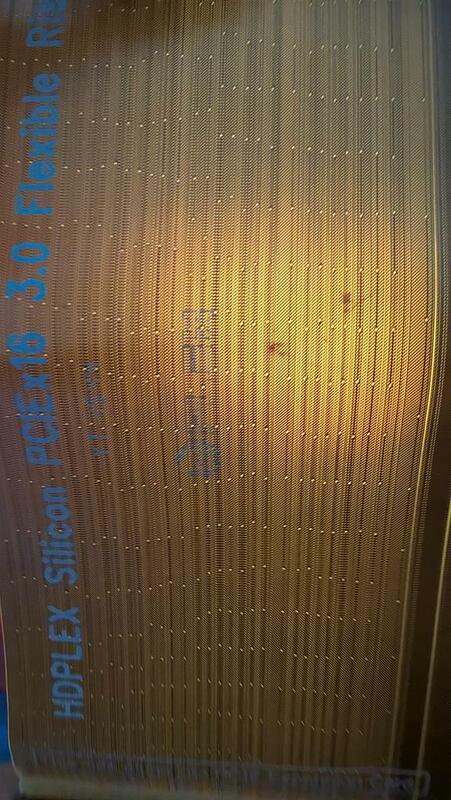 Here you can actually see how the riser still folds up in front of the edge of the mainboard. Even if you placed something right against it, there would be about 1-2mm of clearance to the riser itself. These are the results of running Unigine Heaven 4.0 five times without a riser. We’ll go from here. Score without the riser being folded. The results are fluctuant and we’ve lost about 100 points. I’d call that tolerable, but this was done without cleanly rebooting before it. Apparently it works better when folded. This could be due to all sorts of things, but the bottom line is that the riser doesn’t care about being folded at all. 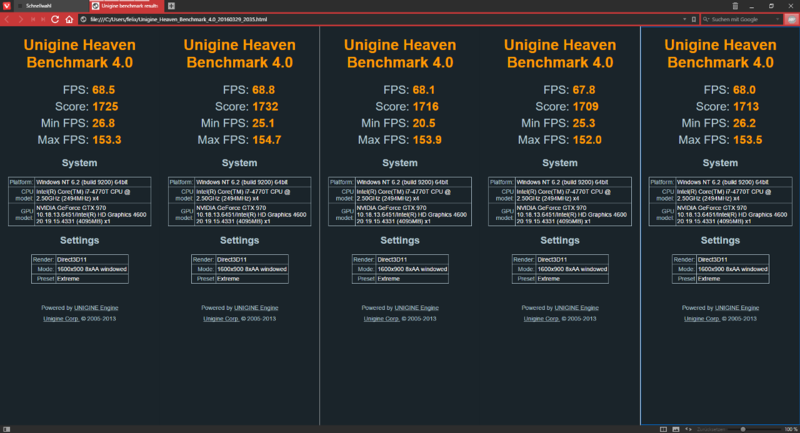 Only 50 points lost on the riser-less benchmarks. I am left extremely impressed with this robust piece of hardware. Posted on May 2, 2016 by hdplex.larry. 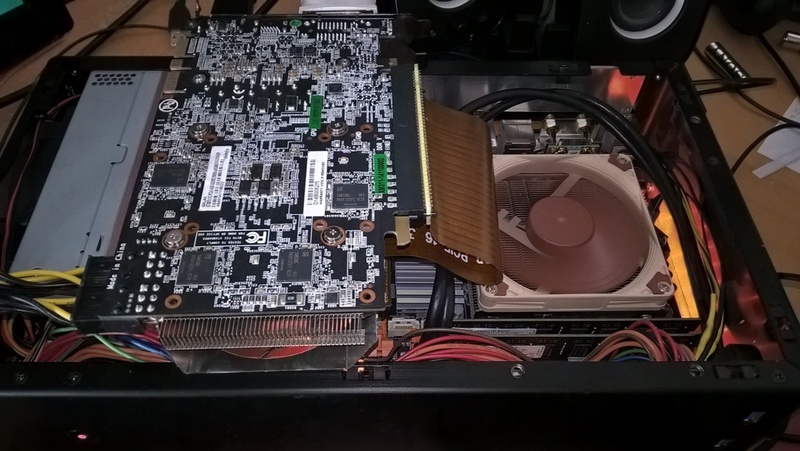 This entry was posted in HDPLEX Fanless Silent PC Review, HTPC Hardware and tagged best PCIE 3.0 Riser, HDPLEX Silicon PCIE 16 PCIE 3.0 Riser Card, high speed riser, PCIE 3.0 Riser, shielded riser, silicon riser. Bookmark the permalink.